Hark! Medieval stallholders, traders and vendors – we want you! Merchants and stallholders selling or demonstrating wares at the medieval market-place is one of the most popular attributes of the Abbey Medieval Festival and a much loved favourite of fans and visitors! The aim of the festival is to provide an authentic medieval environment, including the market place and each year carefully selected stallholders take part. Stalls include items such as medieval food, arts, crafts and weapons such as medieval swords or shields. The period re-created at the Abbey Medieval Festival covers a thousand years – from AD 600 to 1600 – allowing a great variety of re-enactment arts and crafts. What medieval goods do you have? High standards are set for our merchants, crafts persons or artisans, with the bench-mark being raised year-on-year, in order to consistently improve on our reputation as Australia’s most authentic medieval event. With almost 30,000 visitors annually, we welcome new merchants and crafts persons to our market. Participation is on a first-come, first-accepted process, providing the criteria is met. Applications are now open for the 2019 festival, and if you would like send us an application, please read the Medieval Stallholder Requirements to check the necessary details. Wearing a costume appropriate to your time period is a requirement and a general reference to the particular era your goods relate to should also be made in your application. Demonstrators of crafts should use materials of the period; for instance, card-weaving displays should have cards of appropriate materials, such as leather, bone or wood. Modern playing cards used in tablet weaving displays are not in keeping with our medieval theme and are not acceptable. We accept that some crafts may need to use some modern tools and materials however, these should be kept to a minimum and if possible out of sight of the public. Blatantly modern items are not in keeping with our medieval theme and should be hidden or eliminated. And each year we ask traders to work a little harder to become an authentic participant! We especially welcome purveyors of crafts that are specifically medieval, such as pilgrim badge makers, potters making authentic medieval pottery, costumers in the style of the period, armourers, and so on. So, if you are a merchant or craft-person selling or demonstrating wares that were part of the artistic heritage of the Middle Ages, we want you! Remember to check out the details firs, and if you are still interested, submit your application for 2019. MEDIEVAL MARKETPLACE: Food, Wine, Weapons and Crafts. Good morrow, good people. The year 2014 carries us to the 25th anniversary of the annual Abbey Medieval Festival. This silver celebration will see the Medieval Marketplace bustling with excitement as Brave Knights, Warriors and Fair Ladies come from across the ages to choose where to spend their hard earned Gold Pieces. Fill your bellies with food from across the Middle Ages. Find the licensed taverns to enjoy medieval brews. Browse rows of markets to adorn yourselves with various medieval crafts and weaponry. 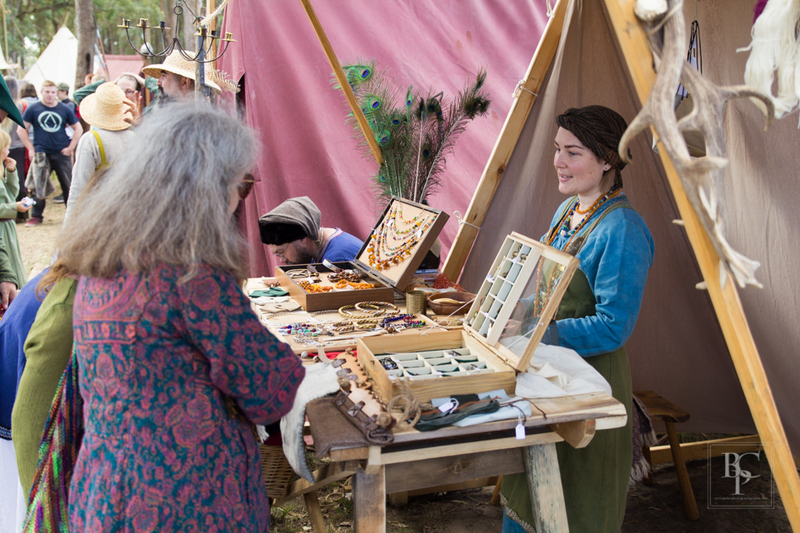 All of our exciting markets will be easy to find with a two page spread in the festival program – read on to get to know what to expect from the Medieval Marketplace. The Medieval Marketplace will be brimming with foods from the Middle Ages of Western Europe and the Near East. Imagine the scent of hot baking bread, sizzling whole pig on the spit, lamb shanks, venison, beef, chicken legs and fire grilled sausages. Now, think about a bouquet of spiced vegetables and stews cooked over a hot wood fire. Flavours that have been enjoyed for centuries all come to life at the Abbey. Foods that make the cool Abbey days warm. Taste the sweet delights that have been made with ancient recipes, all perfect for a weekend of medieval faire fun. There are options available for all diets – vegan, vegetarian, gluten free and those with a nagging sweet tooth. No need to pack a lunch, feast at the festival! The famous Stag Inn and Friars Folly Tavern will be helping us all to celebrate in fine medieval style. The Stag Inn, found in the main market area, will be serving their renowned array of hot pies, platters and toasted mulled wine, medieval ciders and cordials in a rustic straw laden encampment, complete with fire and wooden tables. At the Jousting end of the festival you’ll find Friars Folly Tavern, positioned right next door to the musical entertainment, Friars Folly is a prime location for merriness and tasting of premium recipes of herbed beer, and it is only a stone’s throw from the Jousting Arena! The choice of Craft and Weaponry found at the festival makes holding on to Gold Pieces even more difficult than the smell of fresh food. Be prepared to find quality medieval items ranging from superior clothing, home decor, swords, axes, helms, games, jewellery, museum souvenirs and artwork from specialist merchants with the tricks of the trade. With all of this in mind, be sure to pick up a program at the gates. All of the stalls will be numbered on an easy to use map. The food, craft and licensed areas will be named and numbered, and speciality stalls with vegan, gluten free and vegetarian options highlighted for ease of enjoyment at the festival. We are looking forward to showcasing the finest medieval merchants at the 2014 Abbey Medieval Festival. Help us celebrate the Middle Ages in all of its glory.